This extraordinary new book shows us how to connect with the Devatas, the Divine powers of the universe to develop our deeper Yoga practice. It features special chapters on the Shiva Linga, meditations on Shakti in nature and in the human body, Shakti in the practice of Yoga, special knowledge of the chakras (including the spiritual heart and the crown chakra), the four internal energy centers of Fire (Agni), Sun (Surya), Moon (Soma) and Lightning (Vidyut), the practice of Drishti Yoga (Yoga of perception), Shambhavi Mudra, and important mantras to Shiva, Kali, Bhairavi and Sundari. 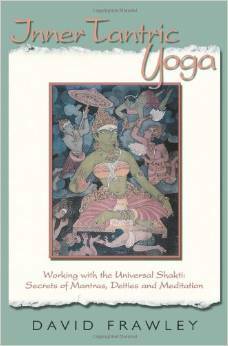 It contains a wealth of deep yogic knowledge not easily available today and based upon traditional Sanskrit sources. The book reflects a new perspective on Tantra overall which shows inner Tantra and higher Tantric practices relating to Self-realization and cosmic knowledge, as taught in traditional Tantra and Vedic lineages. Your view of Tantra is likely to change radically by reading this book. It is based on Frawley’s previous book Tantric Yoga and the Wisdom Goddesses(Lotus Press 1994). Like the previous book, it reflects unpublished teachings of Ganapati Muni, the chief disciple of Ramana Maharshi, India’s great modern Guru and Jnani. Ganapati Muni was perhaps India’s greatest Sanskrit writer and composed a broad range of works on Vedas, Tantra, Yoga and Advaita Vedanta.